The aorta is the major artery that transports blood from the heart to the rest of the body. The sections of the aorta are named according to its trajectory from the heart: the “ascending aorta”, the “arch” and the “descending aorta”. An aortic aneurysm is a condition affecting the aorta where there is a weakening of the muscles within the aortic walls, causing it to widen and expand. An aortic dissection is a life-threatening condition in which a small tear causes the walls of the aorta to split apart. Both these conditions may require urgent surgery to prevent rupture of the aortic wall. Surgery on the aortic arch is a highly complex operation. It is an open-heart operation that involves cooling the body to hypothermic temperatures, deliberately stopping the heart pumping (circulatory arrest) and connecting it to a cardiopulmonary bypass machine. The damaged aorta is then reconstructed using a synthetic tube or graft. Significant risks are associated with these operations. 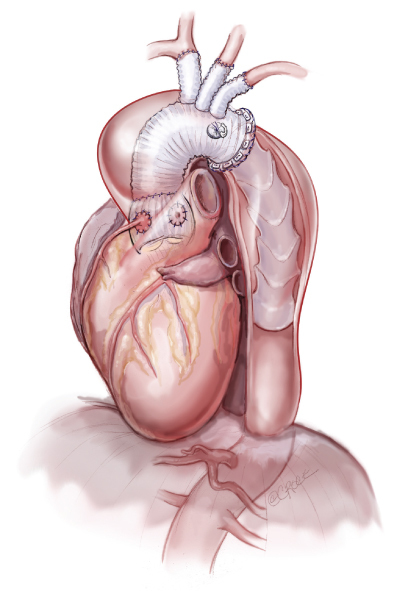 Depending on the location of the damaged aorta and the patient’s state of health, a hybrid surgical approach may be possible. By definition, this involves a condensed portion of open-heart surgery, followed by a less invasive repair utilizing an endovascular approach. Both stages can be performed during the same operation, or may be separated by a short period of recovery. Owing to the need for imaging devices that can visualize the blood vessels, hybrid aortic arch procedures can only be performed in speciallyequipped hospitals. The two main hybrid procedures are known as the “frozen elephant trunk” and the “arch debranching approach”. This operation may be suitable if there is damage to both the aortic arch and the descending aorta (the downstream portion of the aorta). The affected aortic arch is repaired as per the conventional approach in an open-heart procedure. However, the descending aorta is difficult to access via this approach. A special tube is therefore placed into the downstream aorta, creating an artificial inner layer inside the aorta, and gives the appearance of a ‘dangling’ elephant trunk. The tube is ‘fixed’ in position by its expansile nature. Alternatively, a mobile, non-expansive tube can be used. By essentially wrapping the inside of the aorta, it reduces the risks of future rupture and tears. This approach removes the need for circulatory arrest and cardiopulmonary bypass. During open-heart surgery, the main blood vessels branching off from the aortic arch are reconnected to an unaffected part of the aorta, giving the appearance that the aortic arch is ‘de-branched’. A tube is then inserted within the aorta to prevent further complications.